The story started when we were walking along the harbour a few months ago and spotted a familiar face in the Fethiye restaurant world. He was stood outside the doorway of the empty shell that has already been two different establishments in its short lifetime. “Ooooh, what are you doing here,” we asked. Our radars were going into full spin, nosy peeps that we are. Ahh, the buzzword of marketing in Fethiye at the moment. Well, we’ve got the restaurants doing ‘seafood concept.’ Great speciality seafood meze and mains at Girida Balık, Sezai’nin Yeri, Hilmi and, of course, at the eateries of Fethiye Fish Market. Yeah, so why not a bit more meat? (nearby Mancero Kitchen serves up a meaty feast, too.) We waited and watched over the following weeks as the customary smashing, crashing and rebuilding took place to create Çarıklı Et Restaurant. And it was all really looking the part. Windows galore, huge wooden beams encasing the stark metal girders, a bit of an urban feel. Again, this is a bit of a trend in Fethiye at the moment; Kukina Caferia in the town centre has a similar feel. We’re not complaining. Then the big grand opening day came along and all the happy photos of food and a packed out restaurant appeared on social media (good for them) and we just decided to bide our time. We were itching to go and see how meaty this place actually was. But let’s let them get the door and window snagging out of the way first. Let’s wait and let the staff settle and learn what’s what. We waited so long until we couldn’t wait any longer. That urge to go and have a look inside…and peruse all this meat! This is what greeted us when we walked through the door. It’s a whole mix of rustic and urban. It feels really spacious. Maybe it’s the open kitchen (all the kitchen staff nodded and greeted as we walked by) or all of those windows. It’s just a really bright, happy space. ‘Et’ is the Turkish word for ‘meat’ and Çarıklı are a local family of butchers who have been around for a few decades serving the people of Fethiye with finest cuts. If you know Fethiye, you might have seen their butcher shops in the fish market or in Taşyaka. When it comes to all things meaty, well, they know a thing or two. And their tagline? Local bakery, Baba Fırın, has the tagline ‘Ekmeğe Saygı’ (Respect For Bread). Çarıklı Et also have a tagline: ‘Kırmızı Bizim İşimiz’ (Red Is Our Business). You get the picture. The menu gives you a pretty good idea as to the type of food served here, too, don’t you think? We sat down and ordered drinks and were just about to start leafing through the menu when the waiter said we could just choose from the display, too, if we wanted. We love a bit of browsing and pointing, so we left the menus and off we went. Steaks – various cuts and sizes. Other beef cuts – we’ve seen a photo of their chateaubriand (for two people) and it certainly looks impressive. Lamb cuts. Köfte and burgers. Humongous slices of homemade sucuk, a good 10cm in diameter. Various şiş kebabs all made up and ready to hit the open, charcoal grill. And further along, we came to the other delicacies. My nana and grandad would have been in their element! This is the section of the liver, kokoreç (lamb’s intestine), tripe and brain, amongst other culinary delights. All just great to see! Anyway, time to order. A couple of traditional meze dishes – one meaty, one green. It’s not all meat. There’s the usual cold meze selection, too. Barry went for the dry aged beef steak after it was recommended by one of the guys in the kitchen. Two pieces is one portion. Happy days. I was supposed to be going for a steak or a burger and then saw the size of the Adana Kebabı and couldn’t resist. Not sure I ever order what I intend to when we look in fridges. And so we took our table and waited for our little meat feast to arrive. I love to see dressings and seasonings out on a table – saves having to stop the waiter from wandering off after he’s served your food. Meaty fridge display, condiments; we were happy. Simple pleasures. Then the food started to arrive. Oops, we didn’t think about this bit. Like other restaurants in the area, Çarıklı Et Restaurant serve a little appetiser as well as your little appetisers that you’ve ordered. And if there is one thing I cannot resist, it’s traditional Turkish bazlama bread served hot. Just to make matters worse, this bazlama had a light brushing of oil, too, before it was heated. And it was served with a bowl of green olives in olive oil and a drop of nar ekşisi. Well, there was just no way I was gonna be leaving my half of the bread sitting in its basket! As we tore the hot bread and dipped and munched through the olives, our first cold meze arrived. Turp otu salatası. We’ve written in the past about how to make Turkish radish leaf salad so we were curious to see how this one would compare. Mmm, well as you can see in the photo, the Çarıklı version uses whole cloves of roasted garlic. Definitely trying that, next time we make our own. A much softer flavour. Now, usually, when we see a meze fridge, we get over excited and order far too much. However, this meal, although an indulgent pre-Christmas treat to ourselves, was a late lunch so we didn’t want to go too overboard. And we spotted içli köfte, too. It might not look it, but it’s quite filling, especially when you’ve got a meaty main meal arriving shortly afterwards. We contented ourselves with this – and it was more than enough. Loads of meaty filling (well, you’d expect nothing more from a meat restaurant, would you) inside the crisp bulgur casing. Yummy. And then I couldn’t let any of the other meze go to waste, so I ate my other quarter of bazlama, dipped in the dressings. Barry had the common sense to leave his where it was! Sitting there, feeling full from bazlama and içli köfte. And then my Adana Kebab arrived. I like this image. We’ve never seen Adana Kebab presented like this! If you’re in a traditional kebab sofra, you’ll often get a serving of bulgur pilavı or rice, some raw sliced onion tossed in sumac, chargrilled pepper and tomato and perhaps some lavaş bread or pide bread. They all combine on the plate to make the dish. But Çarıklı Et Restaurant is a meat restaurant. This simple presentation above is all about that super long kebab of chargrilled, spicy minced meat. “Shall I bring some more bread,” the waiter asked us while he was serving our food. Nooo, no no. No more bread…because Barry’s steak looked like this. Two pieces of dry aged beef steak of the kontrafil cut (sirloin) – oh, wow it was good. Not beaten out in any way. Just two big wedges of juicy, tender, dry aged steak. Two baked potatoes, chargrilled tomato and pepper. And, not often seen in these parts, asparagus! Just a lovely little unexpected treat. Barry was kind and gave me a sprig. And those onions? We both got those with our meal and we loved them. Again, just something simple but a bit different. Thickly sliced. Very lightly sauteed, we’d say, until they were just on the cusp of starting to soften. The lovely crunch was still there. And as for what they were sauteed in, well, we’ll just have to go again and do another taste test because we couldn’t decide. British chef and food campaigner, Hugh Fearnley-Whittingstall is famous for saying he cooks and eats everything but the oink when it comes to his pigs. Well, there’s certainly no pork at Çarıklı Et Restaurant but these guys are pretty much butchering and cooking up everything but the moo when it comes to their cows…and perhaps the baa, too, with sheep. We love kokoreç as a street food, but we’ve also seen kokoreç pizza on the menu at Çarıklı Et. Great idea – and definitely on our radar next time we go back! A classic Turkish street food, snubbed by some of our Turkish friends in years gone by, now being shown off in a meat restaurant and in a new way, too. We’re all for a bit of that! And on the Çarıklı Et Restaurant Instagram account, there’s a photo of the chef making up a big vat of bubbling ayak paça. No idea if this was for stock or for soup (paça çorbası is soup made from the meat shavings and stock of skull and shin or foot from a cow or sheep), but like we said: Everything but the moo…and the baa. Since writing this post, the menu has changed slightly at Çarıklı Et so we have altered our photo, accordingly. Yes, you now get a piece of wood in the shape of a meat cleaver. Well, it is a meat restaurant, after all! If you want cold meze dishes before (or with) your meal, these change and so are not on the menu. Go inside to the fridges and choose the dishes you want. 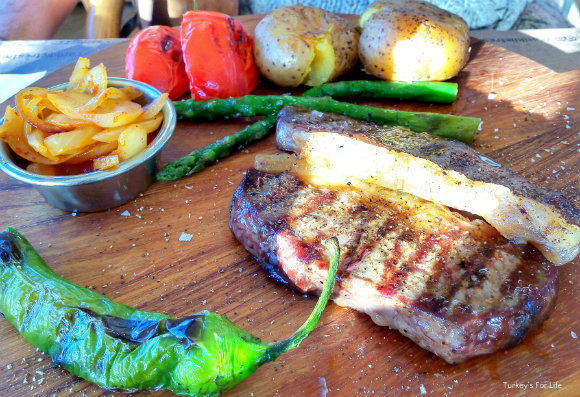 We’ve eaten at Çarıklı Et a few times over the last few months and the their steaks are just wonderful, served with different accompaniments each time, but always with asparagus. And, as you can see in the photo above, their homemade burgers are also pretty hefty – and delicious. Çarıklı Et Restaurant is along phase 2 of Fethiye harbour on Cahit Gündüz Caddesi. The restaurant is open all year round and has indoor and outdoor seating – there are outdoor heaters in winter and covered areas. Prices are very reasonable for the quality of meat – meat is expensive in Turkey. These guys are supplying and butchering their own meat and it looks like they’ve been able to pass that saving on to the customer. Our bill was just over 100 TL (around £25) and included all the food you see above and two large beers. Whilst Çarıklı Et Restaurant is very much a celebration of meat, there are other dishes on the menu including meze, snacks, pizza and pasta. Some of these include vegetarian options. There’s also a full bar, complete with wines and cocktails. You can follow their goings on via their Instagram account and you can also view the complete Çarıklı Et Restaurant menu in English. 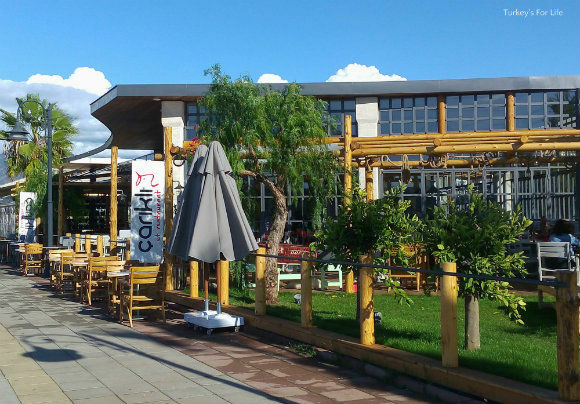 We’ve added Çarıklı Et Restaurant, Fethiye to our page of Fethiye eating and drinking ideas. Thanks a lot for your lovely comment. We’ve never been to Zübeyir but we have heard of it so wondering if maybe some of our blog buddies have written about it. Will definitely look it up. Thanks a lot for the recommendation. we ate here twice in the week, it is that good.